Predominately east of the Cascades, but does occur in some counties west of the Cascades2. Does not occur in King County2. 1Schmidt, M.G. 1980. Growing California Native Plants. Berkley, CA: University of California Press. 366p. 4Corey, Susan; Luna, Tara. 2004. Propagation protocol for production of container Eriogonum umbellatum Torr. plants (116 ml conetainers); Glacier National Park, West Glacier, Montana. 5Parkinson, Hilary; DeBolt, Ann. 2005. Propagation protocol for production of container Eriogonum umbellatum Torr. plants; USDA Forest Service, Rocky Mountain Research Station, Boise, Idaho. 8Dayton, W.A. 1960. Notes on Western Range Forbs: Equisetaceae through Fumariacea. USDA Forest Service Handbook No. 161 Washington D.C.: U.S. Government Printing Office. 71p. 9USDA Forest Service. 1988. Range Plant Handbook. New York: Dover Publications, Inc 816p. 10Stead, S., and R.L. Post. 1989. 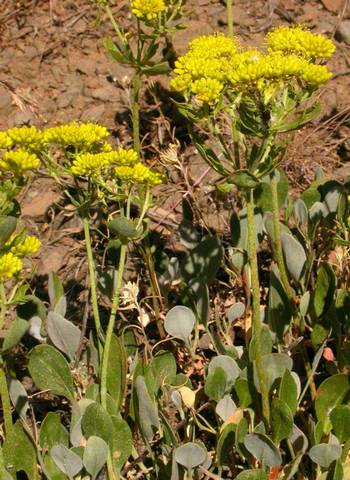 Sulfur flower, buckwheat (Eriogonum umbellatum). Plants for the Lake Tahoe Basin. Soil Conservation Service, Nevada Cooperative Extension. Fact Sheet 89-71. 11Wood, David M. and Roger del Moral. 1987. Mechanisms of Early Primary Succession in Subalpine Habitats on Mount St. Helens. Ecology: Vol. 68, No. 4, pp. 780–790.